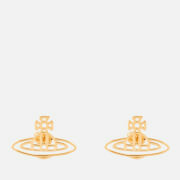 Women's small stud earrings from Vivienne Westwood. The 'Olga' studs are crafted from gold-plated brass and inset with a glossy, faux-pearl. 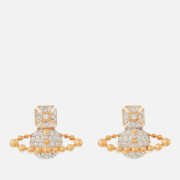 In signature style, the earrings are embellished with an intricate Orb emblem to the centre. Secured in the ear with a butterfly clasp. Presented in a branded gift box.